Japan has always been HIGH on my travel bucket list. The culture, the food, and the modernity has always intrigued me. Upon moving to Shenzhen, China - I immediately had a look at my school calendar to plot out my holidays. Fall Break seemed to be the most logical time for me to go. I shared the idea with my boyfriend and his parents who've also had it on their Asia bucketlists and we began the planning. 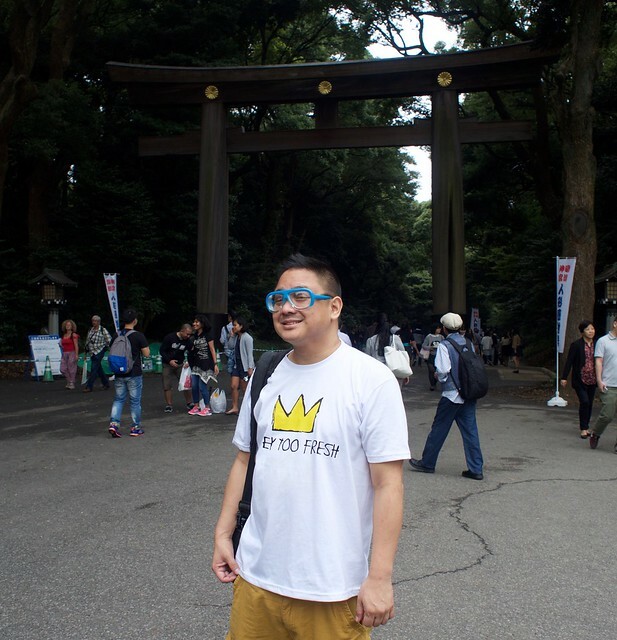 We set the dates - 5 days in Tokyo, staying in Shibuya-ku. Part 1 details some of the sights and eats we enjoyed during this trip and part two: quirky culture + quick tips for when you decide to travel through! Shibuya is one of the more central locations in the city. My only set plan on this trip was to see Meiji Shrine, soak in Tokyo's energy, and to eat so staying near such a huge transport hub was key. When I looked at the AirBnB map - Shibuya is the neighborhood that houses Harajuku, Shibuya Crossing, Yoyogi Park, Meiji-jingumae Shrine. With only a few days in the city - it was the neighborhood where we can see a lot without having to go too far. 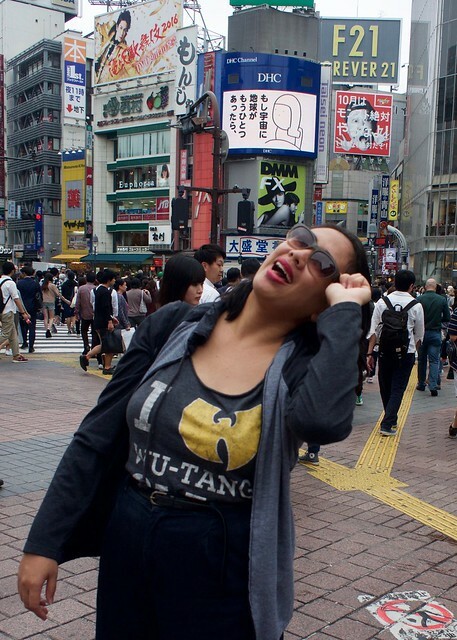 In short - Shibuya is where it's at. One stop from bustling Shibuya station to Harajuku/Meiji-jingumae and you are transported to some of the best urban greenery I've seen since I moved to Asia. We entered the park and followed the crowd/path to the temple. 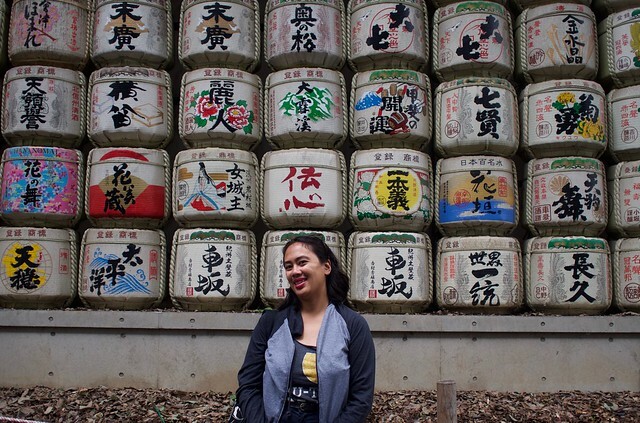 Along the way we stopped at the decorative sake barrels donated to the temple by brewers across the country. Finally the temple. 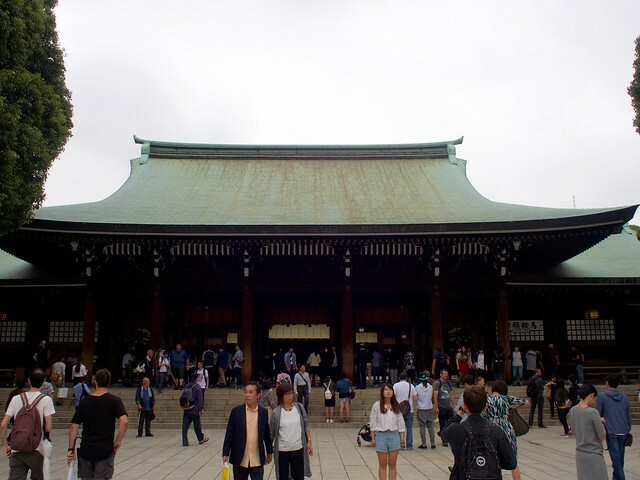 An impressive structure dating back to 1915, dedicated to Emperor Meiji and Empress Shoken. When Joe and I asked each other what we wanted to eat our first day out and about, we said in unison "ramen". Luckily, ramen is EVERYWHERE in Tokyo. We turned a corner in Harajuku and ran into this place. The verdict: good, simple broth. Noodles had a great bite. Conveyor belt sushi at Genki. Prices start at 129 yen ($1.29USD) per platter. After a full morning of shooting Joe's mom's fashion collection, we were STARVING. The solution: ramen 2.0. This time we were with a good family friend who happens to be Japanese. He helped us with ordering and I picked one of my favorites - ramen tsukemen. It is literally noodles + pork gravy = heaven in a bowl. On our last full day in Tokyo, we were wandering around Shibuya looking for lunch and came upon this cozy, unassuming pizzeria run by Italians. They had a great lunch special 1100 yen ($11USD) for pizza or pasta and a drink. It was perfetto. @joeytoofreshestgram and #theroamingfilipina always like to try non-local cuisine in places we visit. This place is run by true Italianos tucked away in a quiet Shibuya-ku Higashi Chome side street. The lasagna and pizza are perfetto. I say this with every fiber of my proud, WILD (Filipina) American self (Galang 96). I state this at the risk of losing readership, but not at the risk of losing face. If you haven't figured out by now from the premise of my blog (identity, travel, living abroad, etc.) that I might have a thing or two to say about intersectionality and race - then MAYBE you haven't been reading my blog too well. How can I authentically engage students in exploring these topics when they may or may not understand these issues as deeply as students back home in the United States? Is it necessary for international schools to create a safe space for their school communities to delve into these issues? Why should it matter to me? How can I cope with my own feelings of hopelessness, helplessness, guilt, etc.? I've been wanting to write about this for as long as I can remember. I just couldn't find the words and for the sake of self-preservation, I busied myself with other things. Lastly, everytime I wanted to write about this before, it devolved into a curse-ridden pile of gibberish. I was too angry, too sad, and everything in between. Now, after a few months spent recharging and thinking about my role as an international school counselor/lifetimesocialworker/FilipinoAmerican/womanofcolor and the role I play with my students and colleagues, my mind is clear. #BLACKLIVESMATTER - because even if at the end of the day I believe that all lives matter, according to the Washington Post, just in 2016 alone, Black citizens dying via police shootings represent 25% of total police-involved deaths and they're only 12.5% of the population. (U.S. Census Bureau 13). In plain speech - in the United States, police-involved deaths happen more to Black people than anybody else. Anecdotally, most - if not all - of my Black friends in the United States are afraid to walk out of their homes and those with sons are tearing their hair out trying to protect them. The pain of Tamir Rice, Trayvon Martin, and countless others too fresh, too close, too young, too soon. Moreover, as a student community service volunteer at UCLA and social worker for 5 years in Brooklyn, a routine part of my role was teaching children and teens (Filipino, Black, and Latino) about their rights and how to respond when confronted by police. When I moved abroad, I began to engage students/colleagues (who aren't always familiar with the US history of oppression) on discussions about what is going on back home and how they might be perceived in the United States, especially if they are considered minorities. Or fielding comments/questions from parents about the safety of their children IF they were going to visit the United States. Furthermore, working at an international school also means looking at world events and social justice issues, patterns of oppression, etc. While I am eager to take this on, I am also quite tired. Each day I think - I shouldn't have to do this. I should not have to teach children how to manage interactions with people meant to protect and to serve them and their families. I should not have to field questions from parents about their children's safety because of the news. I should not have to explore privilege, class, race, gender, etc. with my students - NOT IN 2016. If I don't, then it would not only be a betrayal of my own personal background and cultural history of resistance (Constantino 76), but I'd be betraying my friends and the actions Black people took on during the Civil Rights Movement which afforded the opportunity for my family to emigrate to the United States. I would betray the reason why I became a counselor/therapist in the first place - to help people for the greater good. I've transitioned that desire into international school counseling because I want to see the world and I firmly believe that Third Culture Kids (Pollock & Van Reken 9) have the agency to effect wider societal change. They need the social emotional tools to empower themselves and their communities to dig deep and think critically about how to make our world a better place to live. Because of this - I harness the anger, sadness, confusion, and other emotions I may be feeling and I redirect it towards helping my students explore issues surrounding identity, race, culture, gender and our place in all of it. I write and I engage in productive dialogue with people face to face or on social media. It's the least I can do when I am so far away from home. If Black lives didn't matter to me, I'd be a hypocrite. So this week marks exactly 1 month since I hopped on that Thai Airways flight from Bangkok for Shenzhen, China. I can write about so many things, but I will focus on finding community and a sense of beloging to something bigger than myself. Besides the actual job of school counselor, I was quite adamant to find a school community that is supportive and challenges us to be better - not only as educators, but as people. For me, this not only trickles down from how a school welcomes its new staff to a consistent flow of check-ins, transparency, and feedback. At SIS, not only can I literally walk down the hallway and physically see what's happening in my colleagues' classrooms, but I have been invited in to participate and engage. In turn, they can look in on my office and see the work I am doing. At lunchtime, we all sit, laugh and share. We send messages to each other on WeChat to see if anybody wants to order food or send jokes. On the surface, these are all really small things - but they go such a long way. The first few days, I had to ask people if this was truly happening or is someone going to yell, "psyche!" and suddenly this lovely feeling goes away. Fortunately, I've been told that this place is like this pretty much all the time. People will have disagreements and there will be super hectic days, but there's always some basket that will catch you so you don't fall too far. The "falling" moments have come - believe me. I am very laidback or "even-keeled", but even I will admit that I've been irritated by the lack of (personal) space. Sometimes the pushing, shoving, and shouting at WalMart or getting cut off just walking down the street can be a bit much. A bit much when it is hot, humid, raining and you're trying to figure out how to get into your new building. Sometimes the whole culture of children being seen and not heard makes me have a few "WTF!?" moments in my own housing complex. Theoretically, I've accepted that these issues are more my problems than it is the locals'. At the end of the day, the kids are just being kids. At work, I'm learning a new system and actually have more responsibilities. The first week of school was manic trying to learn the scheduling AND actually make sure the kids were scheduled correctly. I cope with all of this by talking to my new friends about it or I just let myself be "okay" with staying home. Most times, I get a perfectly timed msg from someone on WeChat to check-in, asking how I am doing. We started a "SoulFoodies" group of buddies committed to meeting Wednesday nights and trying all the food Shekou has to offer. The beauty of living in an expat community like this one is that all of your colleagues have gone through the "falling" moments and when the community has an organic system of caring, people know almost instinctively when you need a pick-me-up. Overall, I will say that the first month has been a positive experience with way more ups and downs. Milo and I are back to our daily routines. I am cooking, shopping, and no longer living out of suitcases. Most importantly, I'm in a place where I feel connected. I have a support system here and I am pretty sure it isn't going away any time soon. I am forever grateful for that.